Wangaratta Shire, an area of 8189 sq miles (1960) surrounded the town of Bowen on three sides. It was created as a local government division in 1879, 18 years after Bowen was established and 16 years after Bowen was made a municipality. The origin of the name was probably a minor waterway, the Wangaratta Creek, north east of Ayr. The shire had at least four natural advantages: good cattle-grazing land, fertile river flats (particularly the Don River valley), coal fields and a good harbour at Bowen. Circumstances conspired to deny their full exploitation. The marketing of cattle needed an inland railway, as did the coal field, but government policy came down on the side of a coastal railway, and then spasmodically. A northern line from Bowen to Bobawaba (previously the village of Wangaratta) was opened in 1891 and was extended to Home Hill and Ayr in 1913. 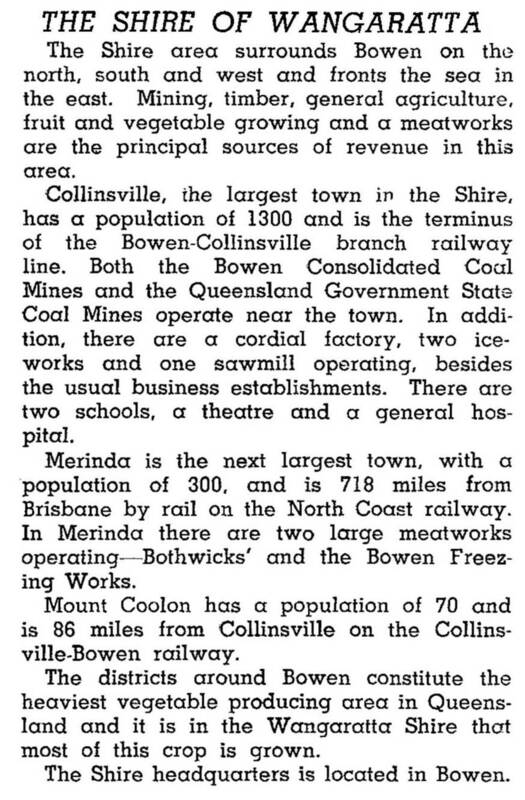 The line passed through Merinda, a few kilometres west of Bowen, where a meat-works was opened in 1897. A southern line did not open until 1910, after Wangaratta Shire and Bowen Town Council had united to petition for it. The fertile river flats were hampered by dry spells, stopping a sugar industry. The tapping of aquifers later brought them into fuller production.